Fantastic Four Annual #2 © 1964 Marvel Comics. COVER ART BY JACK KIRBY AND CHIC STONE. 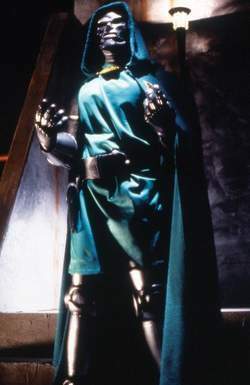 Joseph Culp as Dr. Doom in director Oley Sassone's unreleased 1994 film Fantastic Four. Brilliant heroes tend to cast intensely dark shadows, a literary fact illustrated amply by Victor von Doom, the superscience- and magic-wielding nemesis of Marvel's Fantastic Four (FF). Arguably as essential to the success of Stan Lee's and Jack Kirby's quintessential superteam as any of the Fantastic Four's members, Dr. Doom represents the polar opposite of the sunny optimism embodied by the team's leader, Mr. Fantastic. From his first appearance in Fantastic Four vol. 1 #5 (1962), Doom's armored visage became a symbol of the horrific side of science and influenced later armored villains, including the Micronauts' Baron Karza and the Star Wars franchise's Darth Vader. Young von Doom's destiny was forged when his native Latveria's tyrannical ruler murdered his father, giving the lad an unquenchable desire for revenge that ultimately leads him to seize Latveria's ruling castle for himself. During his long throneward march, Doom uses a combination of his scientific talents and the collection of mystical herbs and potions left by his late mother, who had been a powerful sorceress. The future Latverian monarch's developing techno-mystical skills soon win him a science scholarship to New York's State University, where he meets Reed Richards, the Fantastic Four's eventual leader. After angrily rejecting Richards' well-intentioned attempt to correct his erroneous calculations in a transdimensional projection experiment—actually Doom's attempt to contact his dead mother—Doom is injured when his apparatus explodes. Echoing the Lex Luthor/Superboy relationship, Doom unfairly blames Richards for the mishap, which scars his face and gets him expelled from school (Fantastic Four vol. 1 Annual #2, 1964). Others have subsequently embroidered Doom's origin story, and writer/artist John Byrne's take on the tale is arguably the most compelling. In Byrne's version, Doom's only permanent injury from his accident is one long, thin facial scar. Believing himself to be horribly disfigured, the vain Doom's post-collegiate wanderings take him to Tibet, where an order of monks crafts a special suit of iron armor in which he can hide from his pain. Succumbing to youthful impatience and hubris, Doom permanently sears his entire face when he dons the armor's face-mask while it is still red-hot from the forge (Fantastic Four #278, 1985). Doom subsequently outfitted his armor with numerous offensive and defensive weapons, including strength-enhancing motors, protective force fields, a jet pack, and projectile and beam weapons; he also equipped his Latverian stronghold with an army of Doom robots (his “Doombot” servants) and even constructed a time machine. Despite his bitter enmity toward Reed Richards, Dr. Doom will cooperate with the Fantastic Four when it suits his purposes. When cosmic ray exposure jeopardized Susan (the Invisible Woman) Storm's pregnancy, Johnny Storm (the Human Torch) called upon Doom to save his sister and her baby after Reed Richards—the child's father— proved incapable. Doom's superscientific expertise rescued both mother and daughter, thereby scoring Doom a major psychological victory over the hated Reed Richards, who had to agree to name the girl after Doom's lost love Valeria. Doom reveled in the fact that Richards will always be reminded of his own shortcomings— and his deep debt to his oldest foe—every time he sees Susan or little Valeria (Fantastic Four #483, 2002). Although he never hesitates to grab power or to launch merciless attacks against adversaries such as Reed Richards, Spider-Man, the Avengers, or the X-Men, there is a good deal more to Victor von Doom than a conqueror's lusts. Although he demands complete obeisance from Latveria's citizenry, Doom governs his subjects with surprising benevolence, filling their every material need. As a head of state, Doom also enjoys diplomatic immunity in most nations, much to the frustration of every superhero who has matched wits with him. Doom made the jump from comics to television with The Fantastic Four (1967), an animated series in which he was voiced by Paul Frees (better known as the voice of Boris Badanov). Doom also appeared in 1981's Spider-Man and His Amazing Friends, in which he was voiced by Shepard Menken; frequented 1994's Fantastic Four series, in which Simon Templeman and Neil Ross portrayed the Latverian potentate; and guest-starred in the animated short feature Spider-Man: Attack of the Octopus (2002), in which Mark Meer portrayed Doom. In Fantastic Four, part of the Marvel Action Hour (1994–1996), Lorne Kennedy supplied the voice beneath the armor. From the 1980s forward, Dr. Doom became ubiquitous in toy stores as well as on TV sets, adorning products ranging from Colorforms sets to Halloween costumes to video games to the action-figure lines of Mattel, Toy Biz, and Marvel Legends. Comic-book reimaginings of Dr. Doom have also continued apace during the past two decades. Under the stewardship of writer John Francis Moore and artist Pat Broderick, the lord of Latveria—or perhaps a facsimile of same—resurfaced near the end of the twenty-first century and immediately began using the original Doom's technology to try to impose order on a chaotic, dystopic future (Doom 2099, 1993–1996). In 2003, writer Neil Gaiman and illustrators Andy Kubert and Richard Isanove crafted a comics miniseries titled Marvel 1602, which placed many familiar Marvel characters into the Elizabethan era—and presented the nefarious Count Otto von Doom, ruler of Latveria and murderer of Queen Elizabeth. In 2004, Marvel's acclaimed reimagining of the Fantastic Four (the ongoing Ultimate Fantastic Four series, launched in 2004) directly linked the origin of Doom—plausibly rechristened Victor Van Damme—to that of the Fantastic Four by placing Doom in the same transdimensional accident that gave the heroes their powers. In a twist on the original Doom origin story, Van Damme discovered a possible error in Reed's calculations and introduced a correction factor that may have caused the accident. Van Damme's armor, which includes Satanic-looking cloven hooves, is an organic, builtin consequence of the FF's origin mishap, and he has been revealed to be a descendant of the dreaded Vlad Tepes, better known as Dracula. The new Doom lives up to his ancestor's “Impaler” reputation by skewering his enemies on sharpened spikes carried by fast-flying mechanical insects. 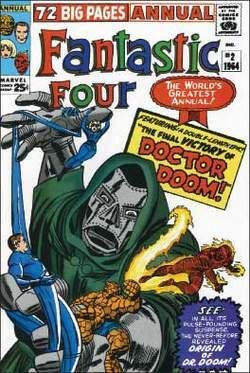 Although the 1994 live-action The Fantastic Four (produced by Roger Corman and directed by Oley Sassone) was never released, it anticipated the integration of Doom into the FF's beginnings in Ultimate Fantastic Four and in 2005's big-budget Fantastic Four feature; in the latter, Doom (portrayed with compelling menace by Nip/Tuck's Julian McMahon) is more boardroom raider than legendary vampire, patterned on Donald Trump rather than on Dracula. Leading the lineup is Avengers Assemble, which tells the story of how a group of superhero (our favorite, The Avengers) learned to overcome their differences and worked together to defend the planet against Dr.
Nouriel Roubini, the famous economist nicknamed Dr. PRIVATE EQUITY 2014: ROOM FOR OPTIMISM? The name Viktor Vaughn comes from Victor Von Doom, the real name of Fantastic Four arch-enemy Dr.
New York University economics professor Nouriel Roubini, who gained fame as Dr. The trailer shows Iron Man, Captain America, Black Widow, Spider-Man, Deadpool, the Incredible Hulk, Dr.
Great SFX as they trash New York in a head to head with arch rival, the metallic, maniacal Dr. He is about to film the sequel to last year's comic-flick smash hit Fantastic Four, reprising his role as the nasty Dr.
Tim Story's bigscreen adaptation of "Fantastic Four" is distinguished by a lighter, more comic touch than recent comicbook films such as "X-Men" or "Spider-Man": There's no heavy social message behind the Human Torch or Dr. The plot of Fantastic Four: Unthinkable is simple: Victor von Doom, aka Dr. There's Jamie and Sonia, Nat and Barry (if she went on top, her ears would pop), and now Kat is betraying her daughter (again) with dozy Dr.
Boasting a total of 12 playable heroes, The Infinity Gauntlet also features two new levels in which players can turn the tables and play as Dr.
Dr Gloom is often joined in his advocacy of bigger stimuli packages by Dr.